Hotel Transylvania 2 trailer out now! The Drac Pack are back!! 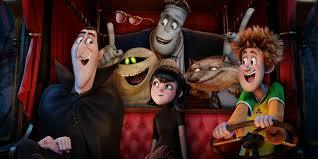 The sequel to the amazing Hotel Transylvania is looking ace in this brand new trailer! All the guys from the first film are back PLUS some brand new characters too! Hotel Transylvania 2 is about Dracula’s dad, Vlad, coming to visit the hotel and he is not at all happy that Dracula is letting humans check in! The film is coming out October 9th, just in time for Halloween! You can check out the trailer for yourself below!